The HPC50 handheld pressure calibrator is an intrinsically safe, dual pressure calibrator with options to add an additional two external pressure or temperature modules. The HPC50 pressure calibrator combines the features you love from the HPC40 with improvements like, better battery life an improved display, an extra external module connection, and of course intrinsic safety. The HPC50 series pressure calibrator is fully temperature compensated for pressure, temperature, and electrical measurements from -20 to 50C. Combine the HPC50 Series with any of our ready to use pump systems, to provide a complete calibration kit. The HPC50 handheld pressure calibrator is an intrinsically safe, dual pressure calibrator with options to add an additional two external pressure or temperature modules. The versatility of the HPC50 combined with the “advanced simplicity” interface makes navigating between functions quick and easy. No deep menu structures. No hidden icons. Just advanced simplicity. 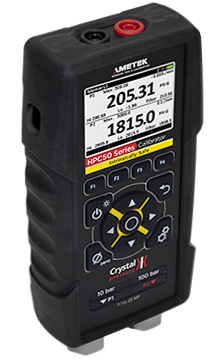 The HPC50 Series can replace multiple pressure instruments with a single hand-held device. Gauge Pressure, Absolute Pressure, Barometric Pressure, and Even Differential Pressure area all available in a single unit. See how a special DP tared mode increases your accuracy. Scaling and Percent Error are two of the functions on the HPC50 Series that save time and reduce errors. See how easy these functions are to use on the HPC50 series pressure calibrator.